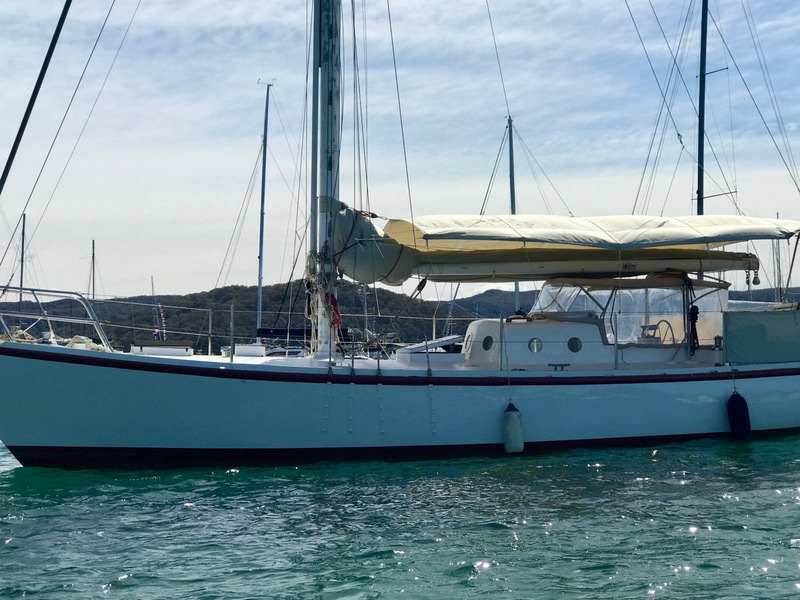 This fabulous, incredibly strong and immaculately presented yacht is an be an ideal live-aboard and offshore cruising yacht. Sometimes, albeit rarely, an exceptional boat suddenly arrives on the market for a very affordable price, and 'Bird of Passage' is surely one of them. 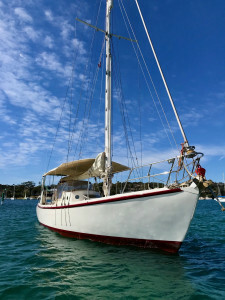 For those unfamiliar with ferrocement-built boats, I would like to calrify a few things so that this beautiful yacht can be fully appreciated. 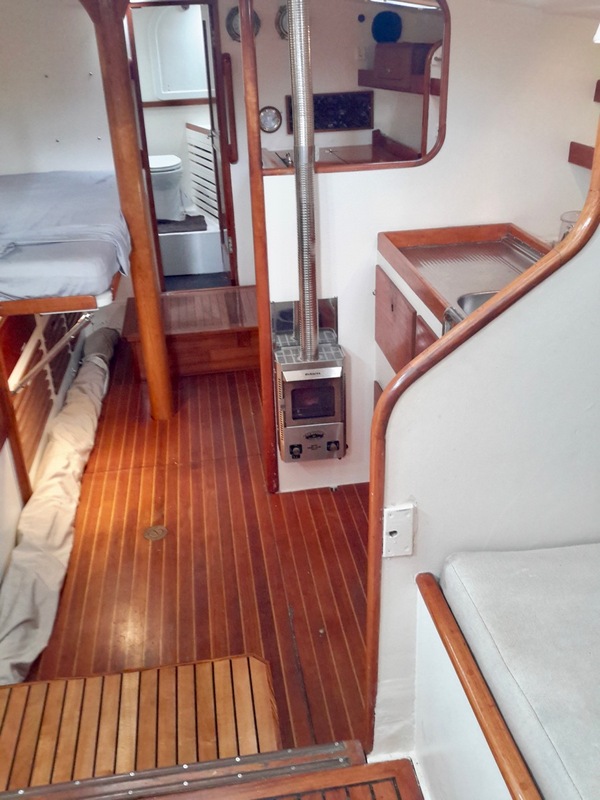 Yes, many were built during the 1980's that unfortunately were terrible enough to give 'ferro' boats a bad name. 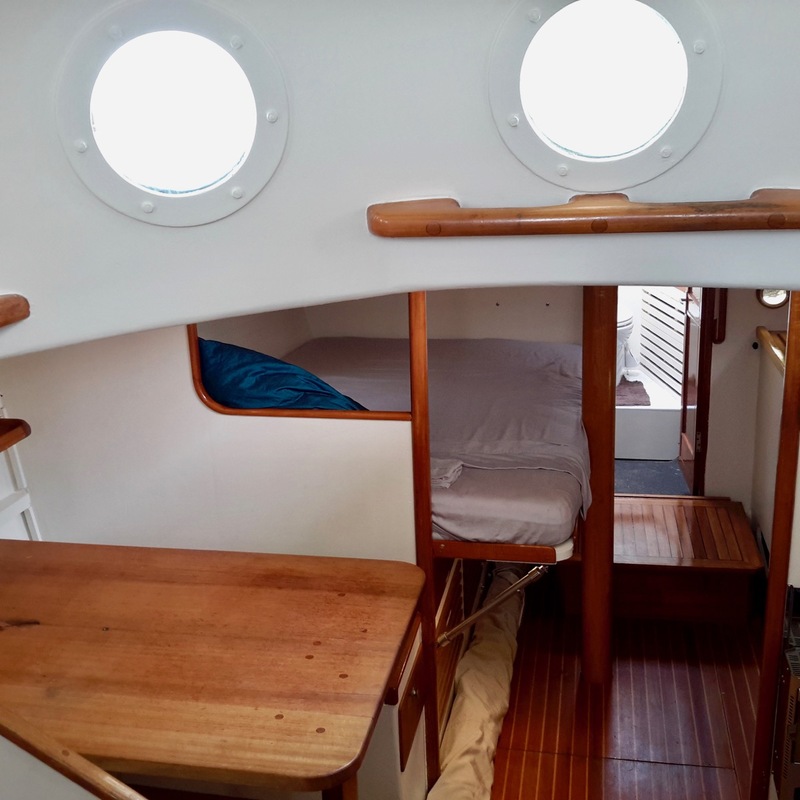 However, until recently and with the change of cruising sailors demographics who can now afford far more expensive boats, ferrocement yachts were one of the most represented type of boats in anchorages around the world and for good reasons. 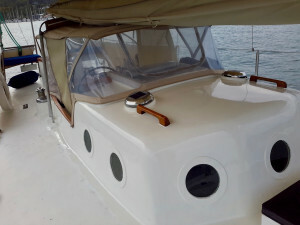 They are lighter than wood or steel but far stronger then GRP, are fire resistent, are cool in the summer and warm in winter, mould resistant, don't get osmosis, are incredibly cheap to maintain, are stronger with each passing year instead of becoming more fragile and likely to either become spongy, rotten or delaminated (ferrocement boats take 50 years to fully cure! ), and when well built are an appealing option for someone who could not afford or do not wish to spend a fortune to get a strong, comfortable and capable vessel. 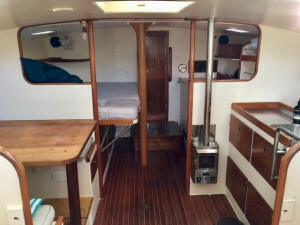 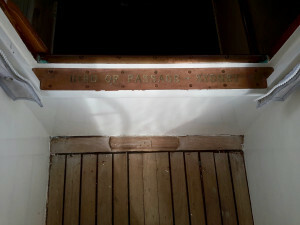 (An identical boat as 'Bird of Passage' built of GRP would easily cost three times as much). 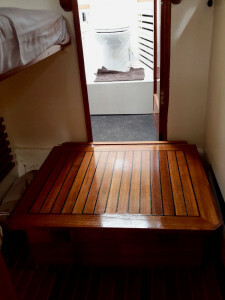 Every type of material will have its merits and disadvantages. 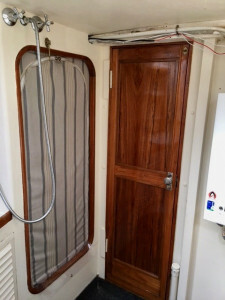 For wood it is quite obviously rot, for steel it is rust, for aluminium the dangers of galvanic corrosion are ever present, and for fiberglass delamination, osmosis, inevitable time degradation and of course a less strong build, compounded with terrible depreciation for the mass-produced production boats. 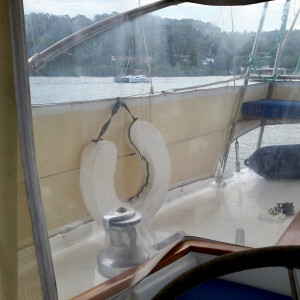 If by now most of the 'bad eggs' have either sank or been put out to pasture, the remaining well built and well maintained ferrocement vessels are quickly changing the way people see ferro. 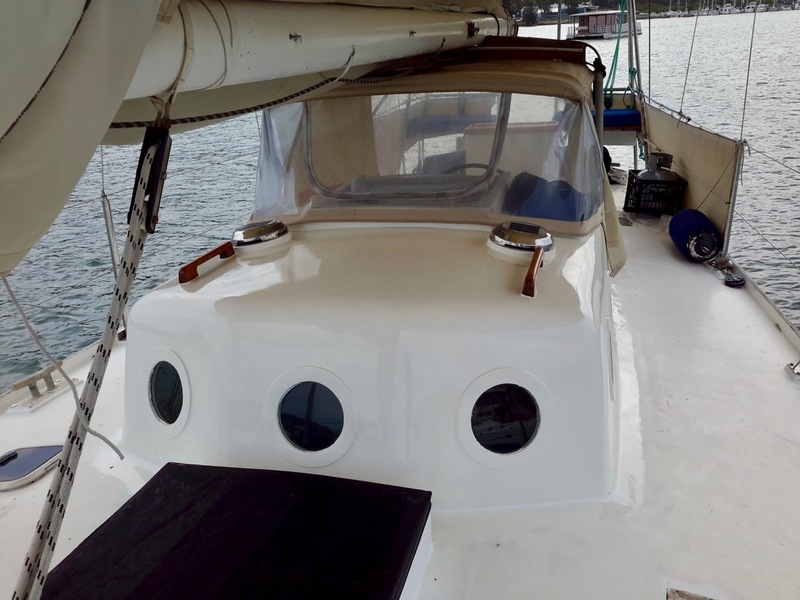 As cruising specialists running an international cruising network with representation all over the Pacific Islands, Asia and Europe, we are well-placed to know that surprisingly for some, ferrocement boats are very much alive and well amongst the cruising community. 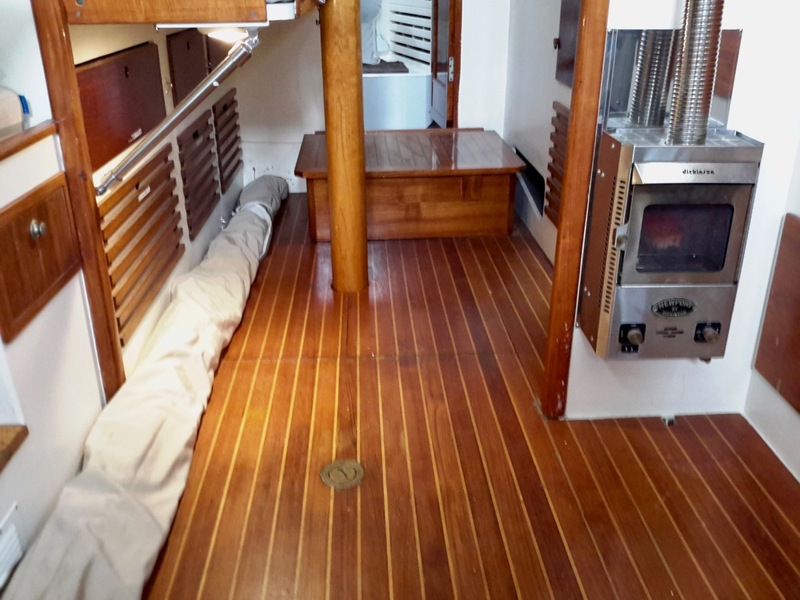 Most of these boats are 30 to 60 years old, and most look remarkable (cruisers take care of their boats). In fact, many of them are very hard to pick as ferrocement, and look exactly like a steel or GRP boat. 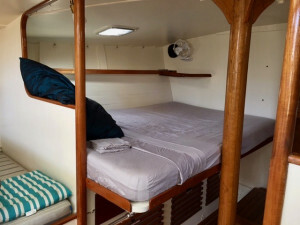 'Bird of Passage' is such a boat. 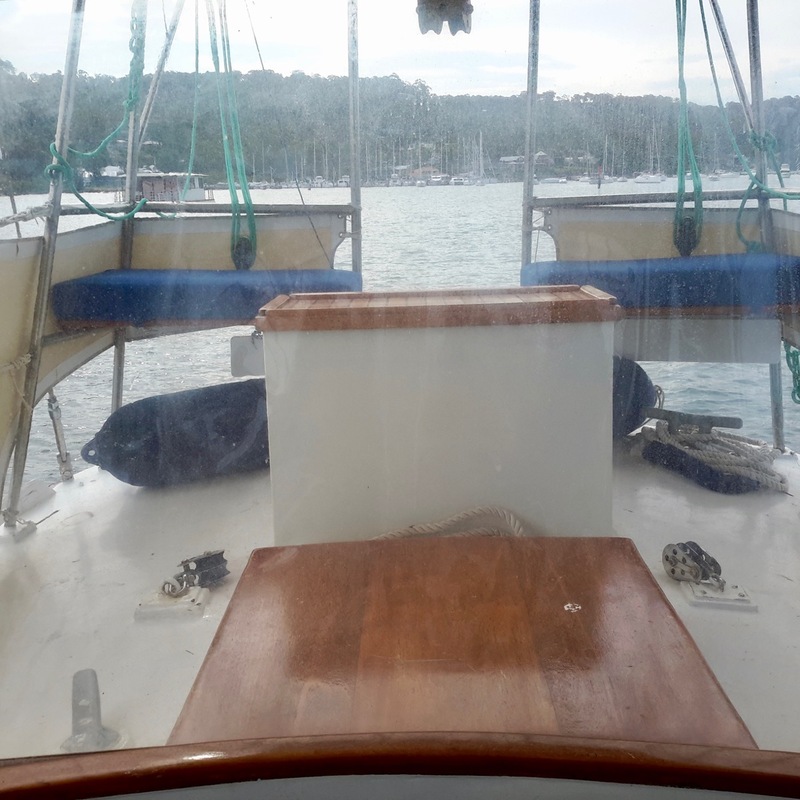 Even at close range, she simply looks like a strong displacement GRP boat from an era when these boats were built to survive almost anything. To further protect her hull and to render her as smooth as a GRP boat 'Bird of Passage' was fully faired and sheathed with fiberglass, before being painted with top quality two pack paint (Awlgrip), which adds further insulation to the hull and provides a shiny, polish-able finish. 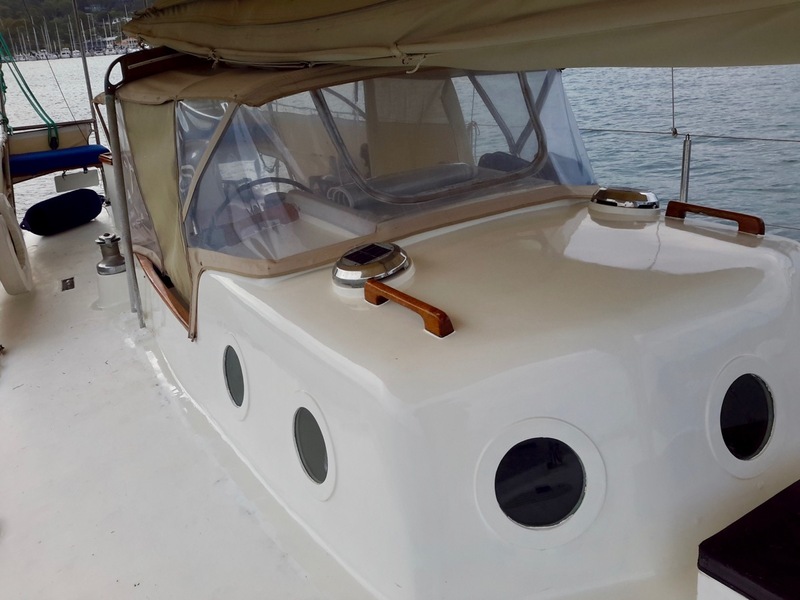 Technically, she can be described as a composite boat, which core is ferrocement over a steel frame instead of foam or balsa wood (as for most production boats), and which shell is GRP, epoxy and to finish a two-pack polyurethane paint. 'Bird of Passage' was built by master shipwright and experienced seaman Standford Smith who used a design of Francis Fradette from Nth America. 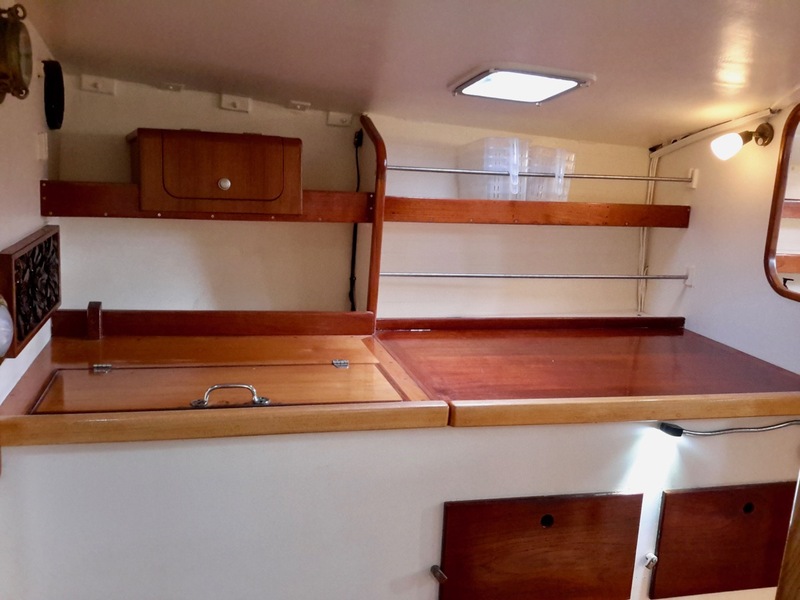 Original survey by Innes & Burch states, " The workmanship in the steel work of this hull is excellent and she is well constructed and tied together and should be of exceptional strength. " 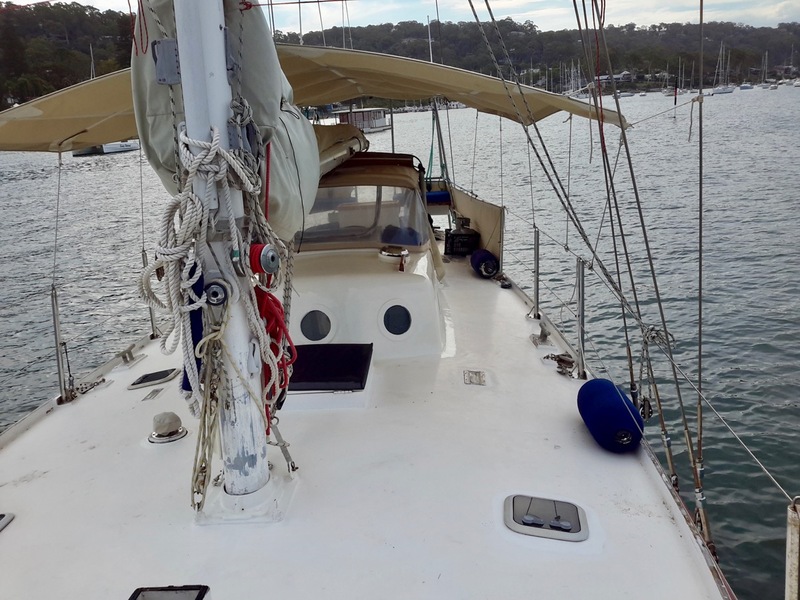 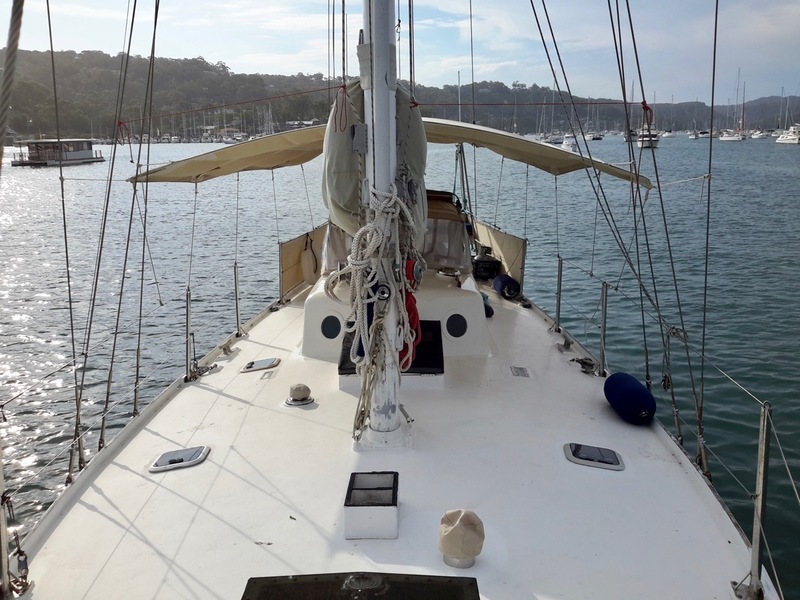 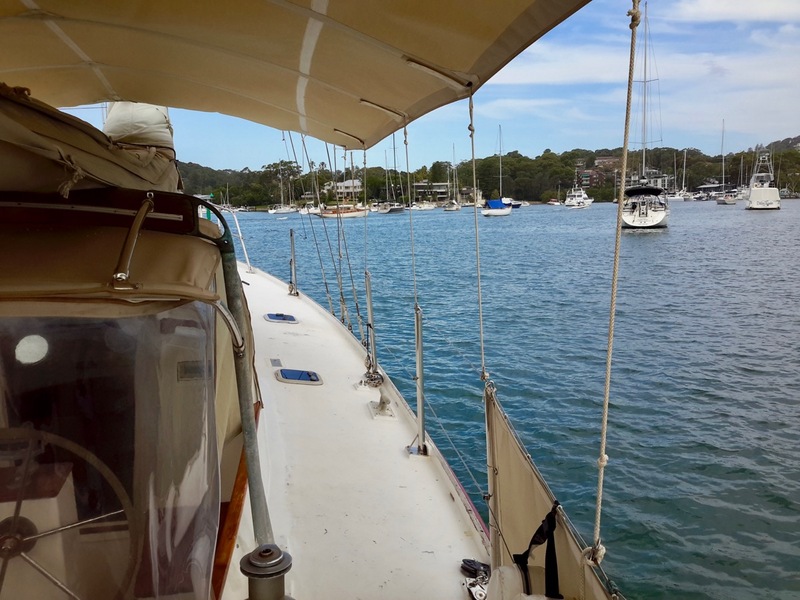 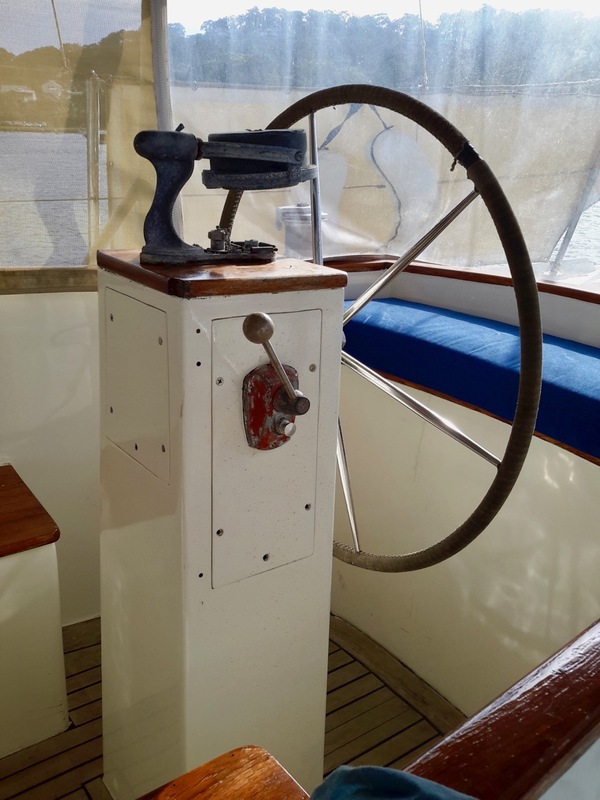 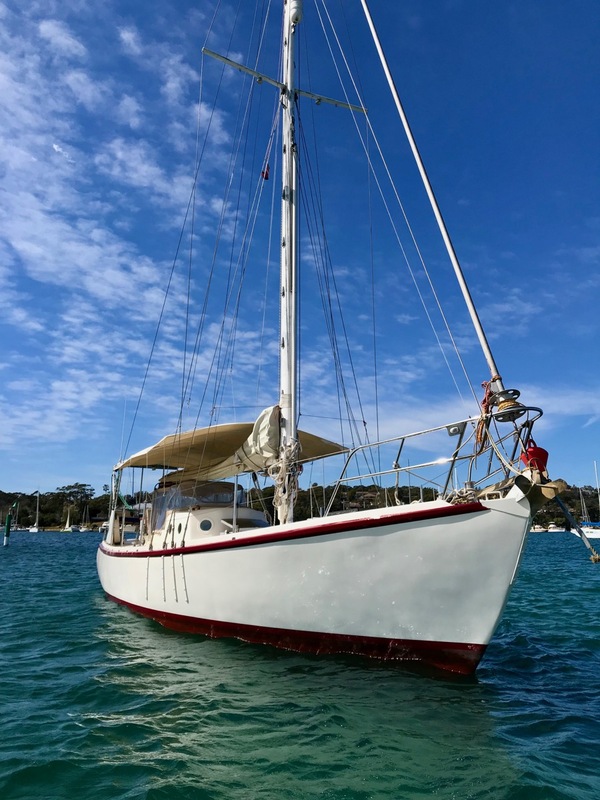 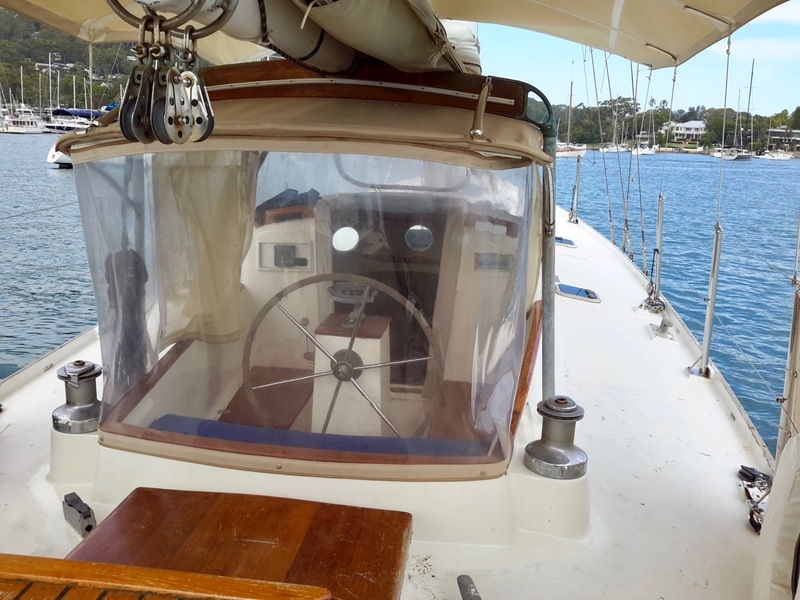 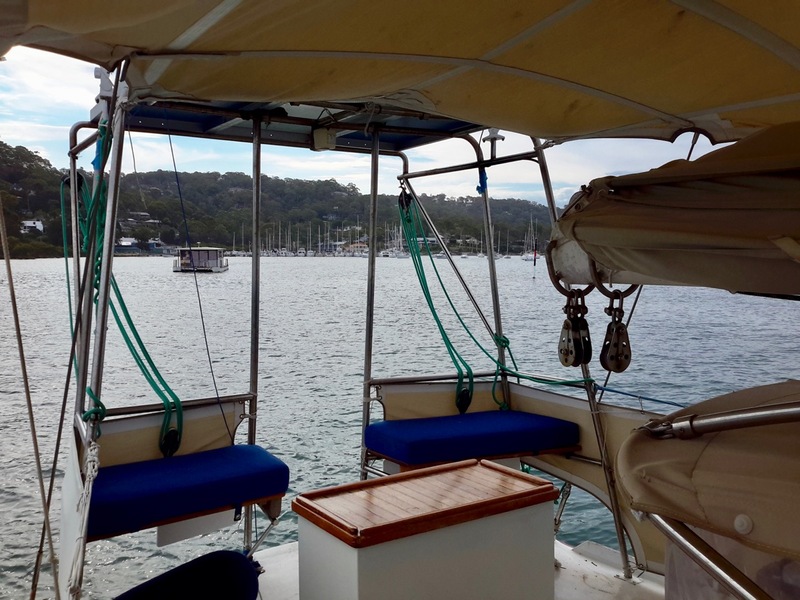 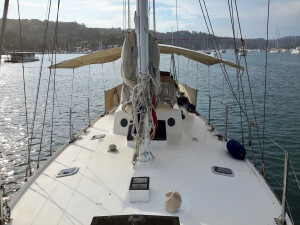 She is in excellent condition having been lovingly maintained and modernised by her owner, a well known shipwiright in Pittwater (Sydney) for his restoration of traditional boats. Prior to this she was the pride and joy of another marine specialist who lived on board for many years, always keeping her in the most immaculate condition. 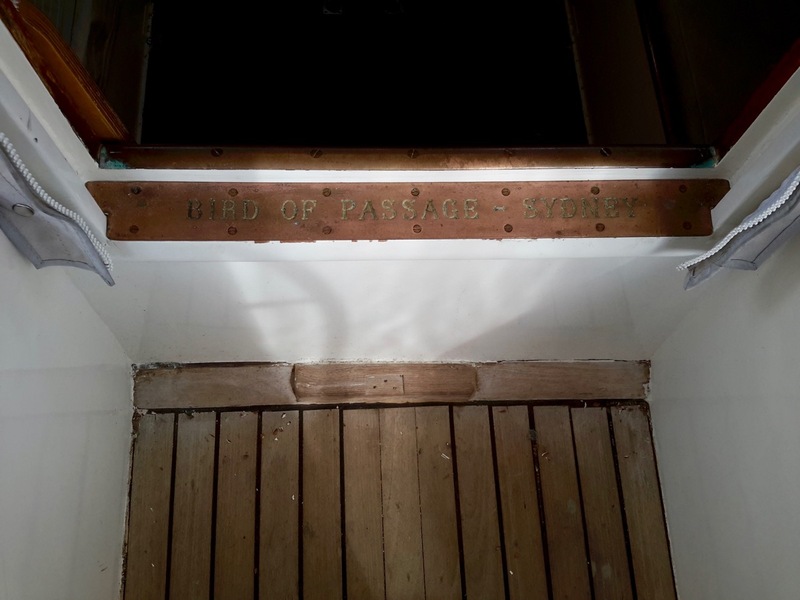 We have known 'Bird of Passage' for several decades and can testify to the regular care she has always been given. She is not a boat that was neglected at any stage, and suddenly 'renovated' just before being put on the market. 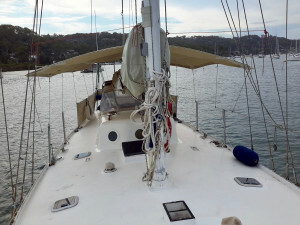 Sadly, her current owner passed away a short time ago as he and his wife were preparing to go for an extended ocean cruise. The yacht has subsequently been put on the market. 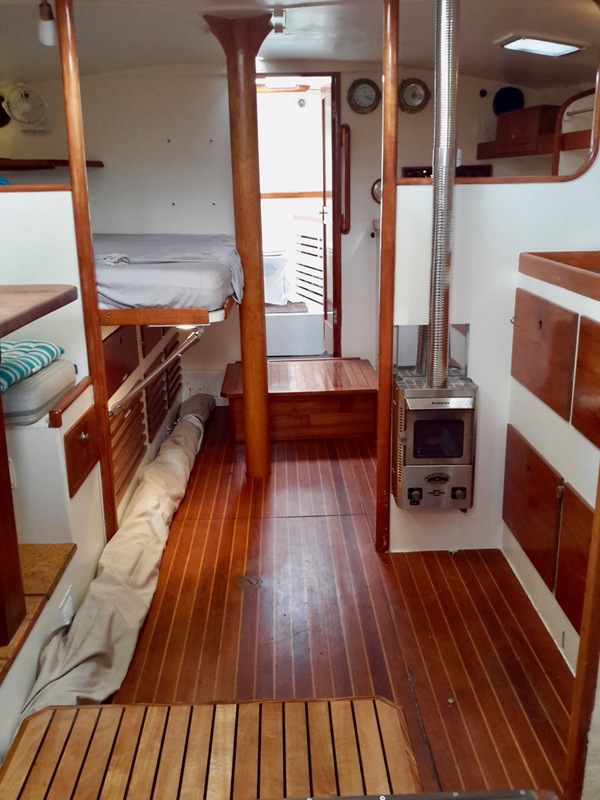 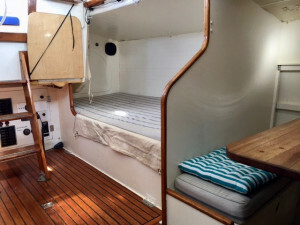 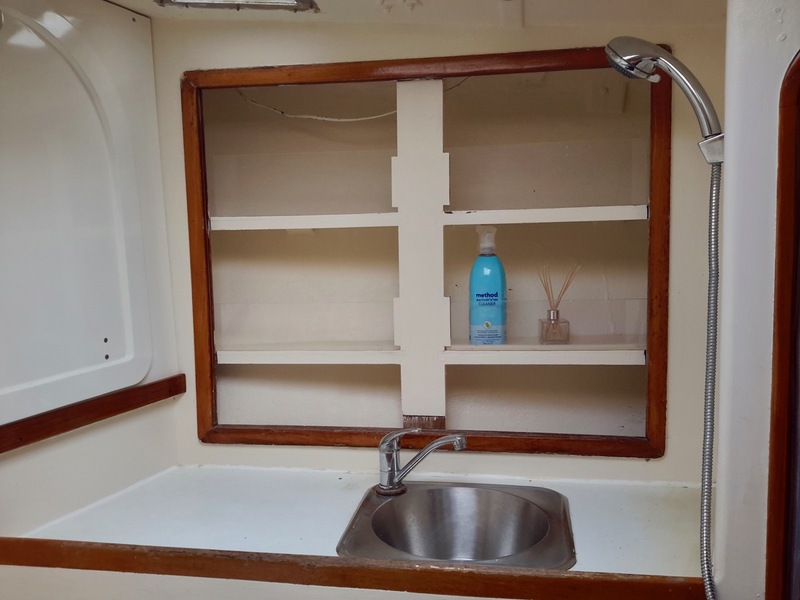 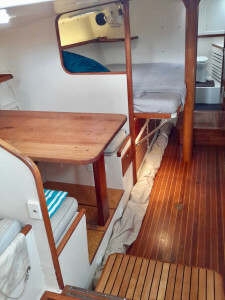 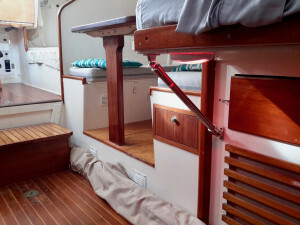 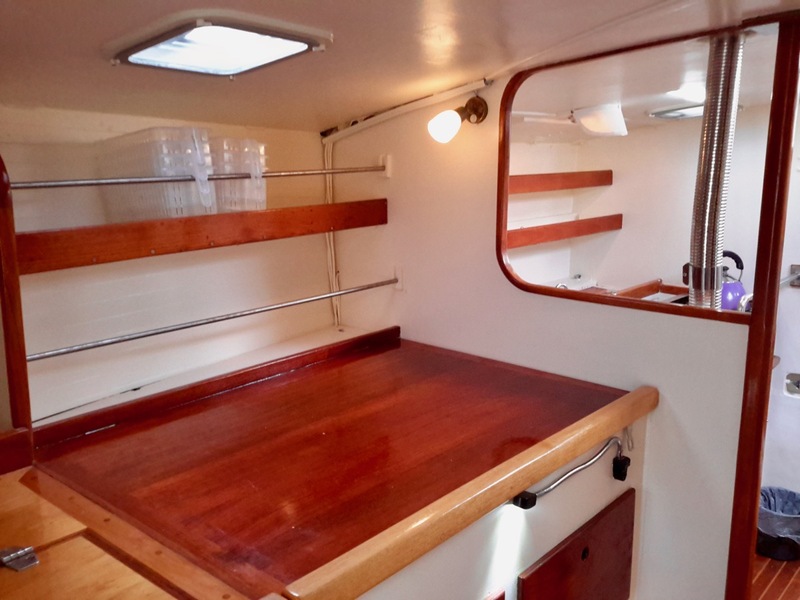 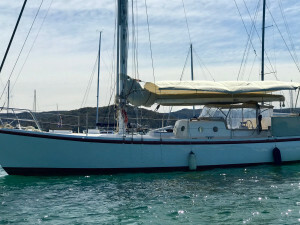 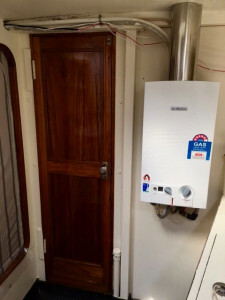 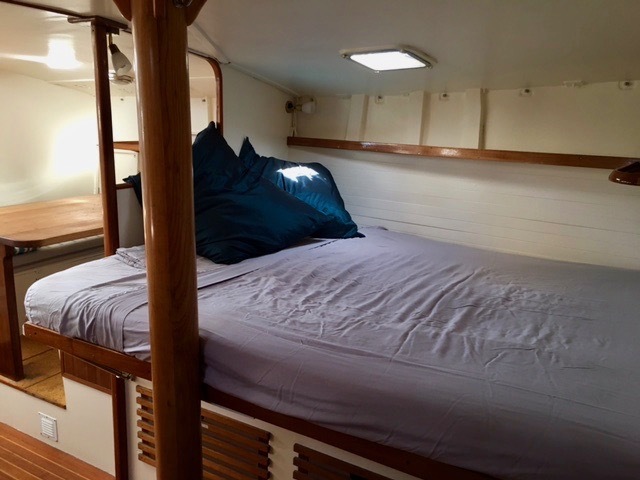 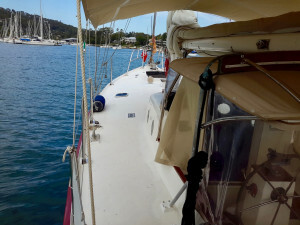 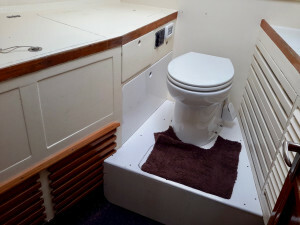 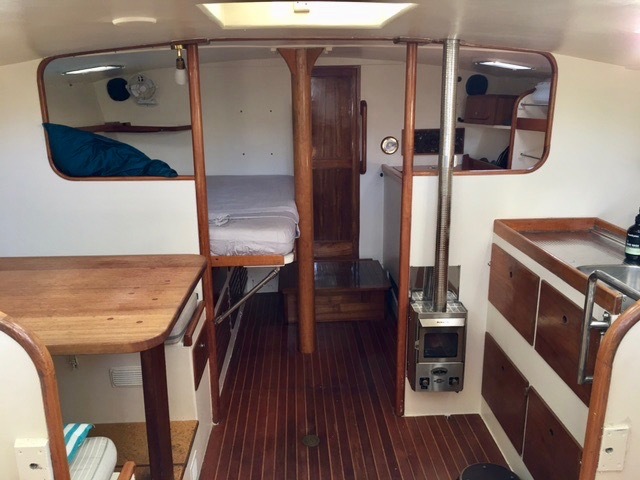 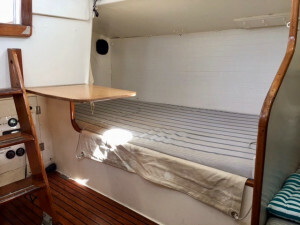 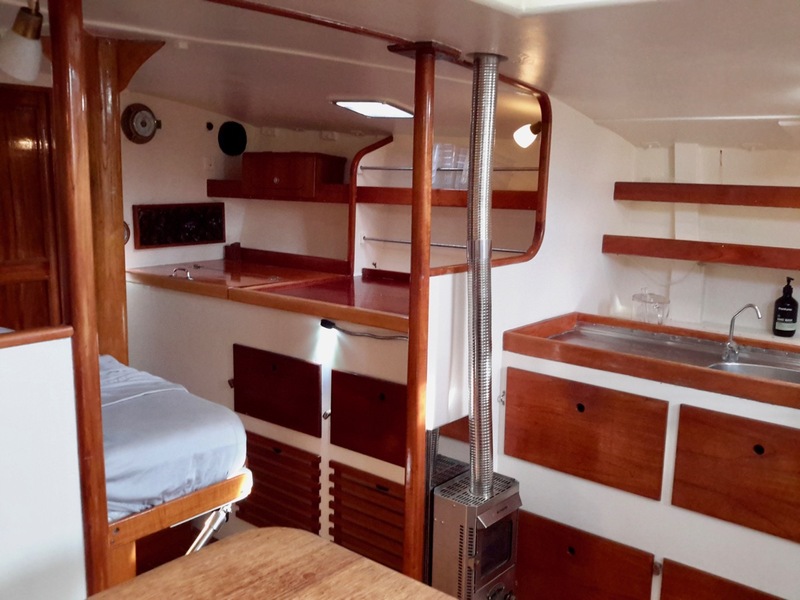 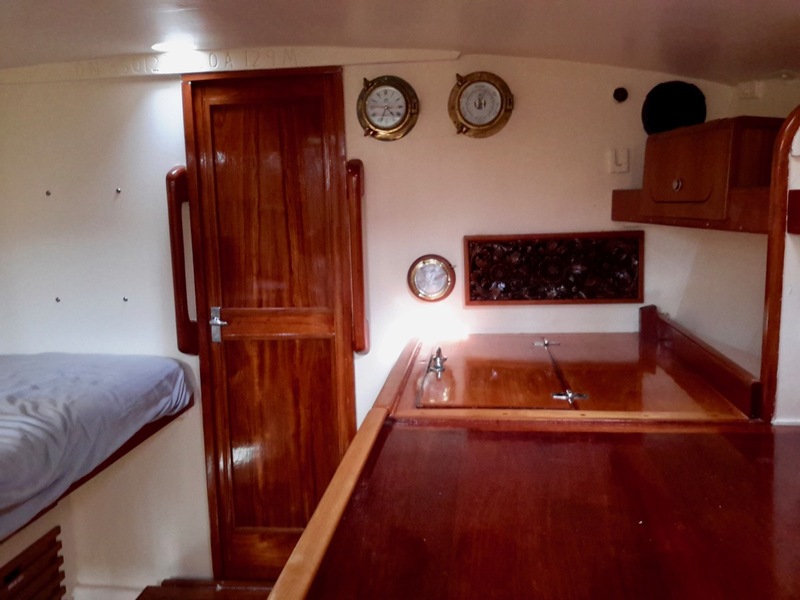 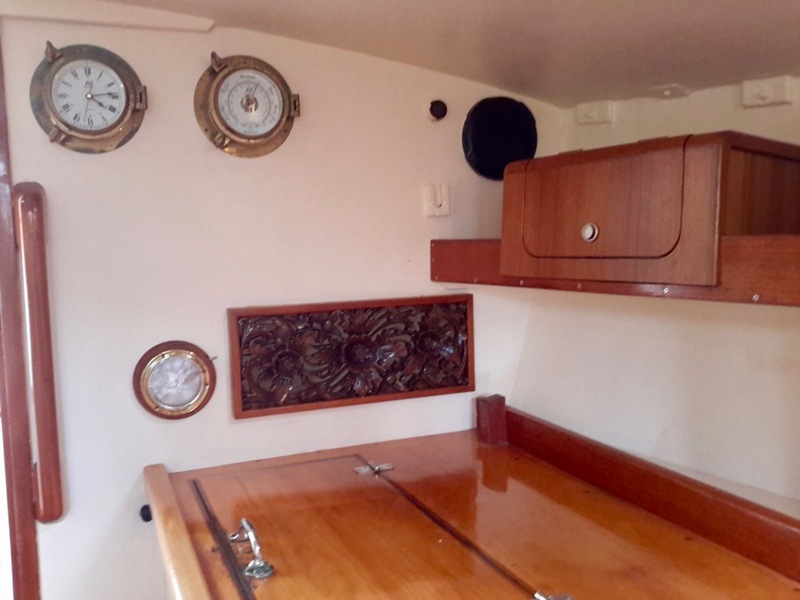 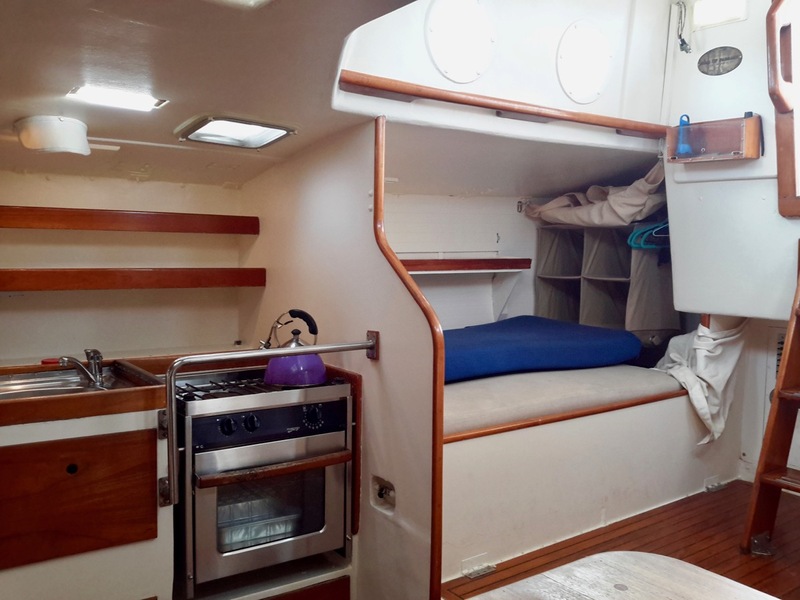 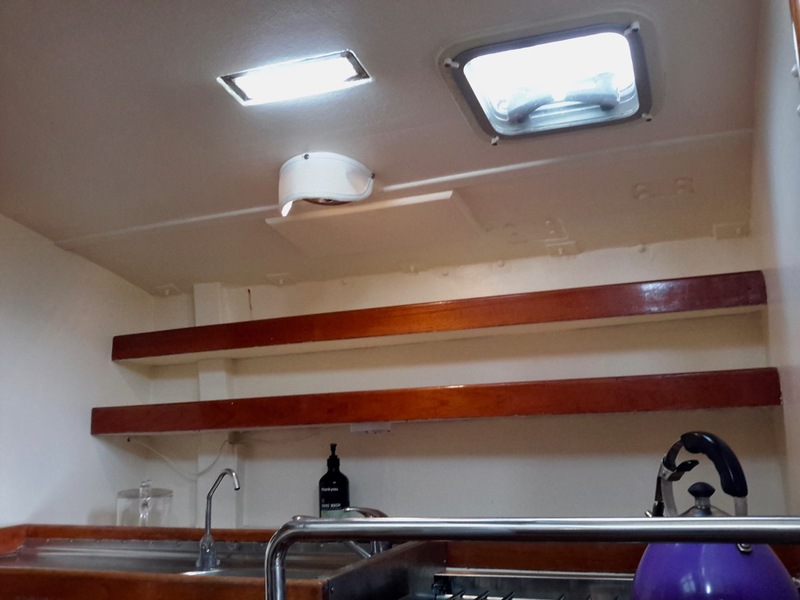 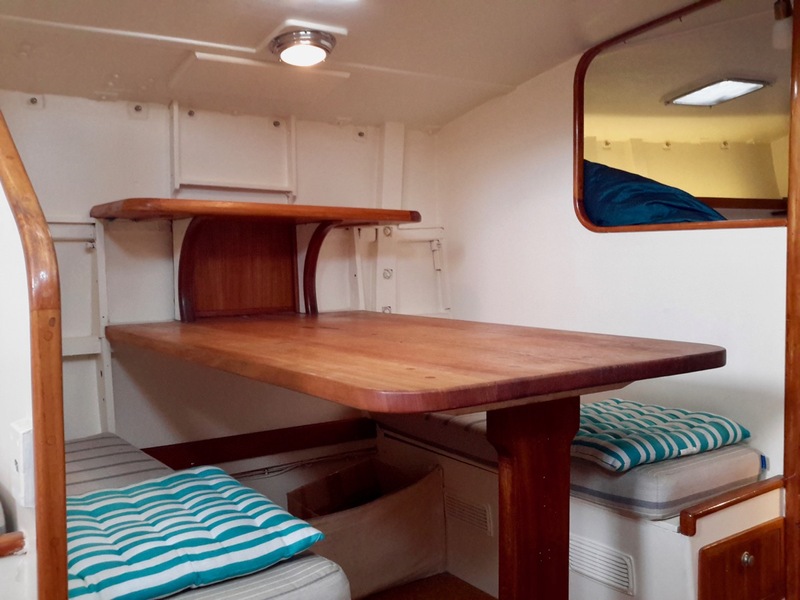 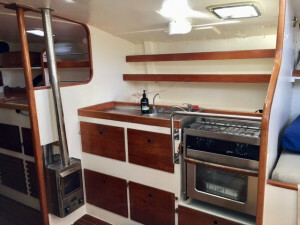 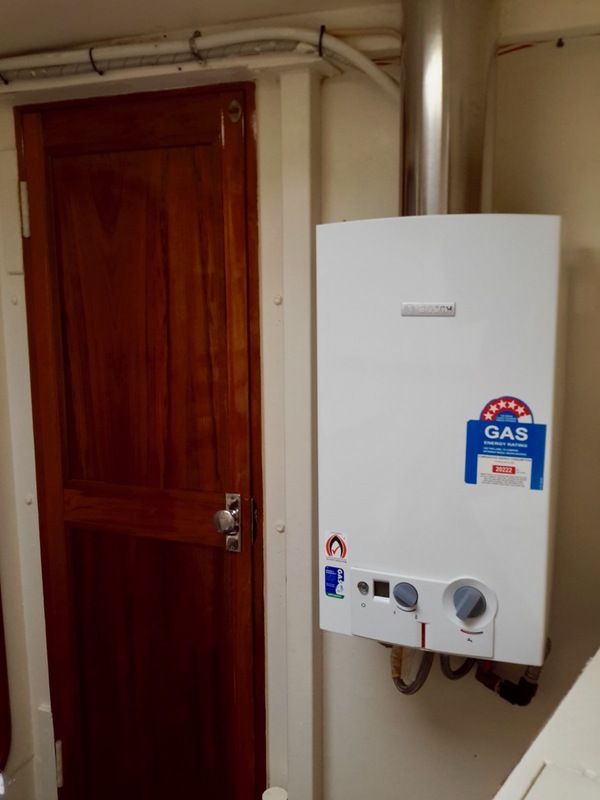 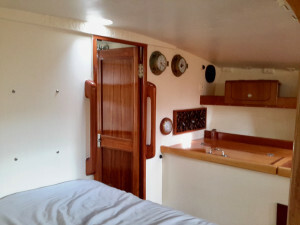 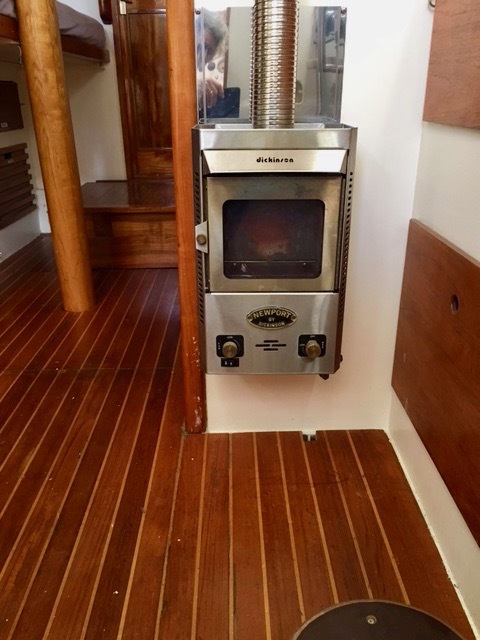 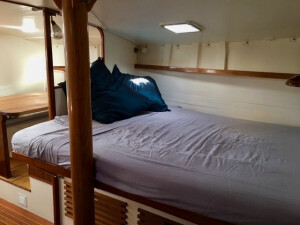 Recent upgrades include a full interior repaint, all electrics and plumbing upgraded, new hot water system, electric toilet with holding tank, excellent Dickinson gas heater, oven and cooktop and bluetooth radio. Diesel engine serviced regularly and is very reliable. 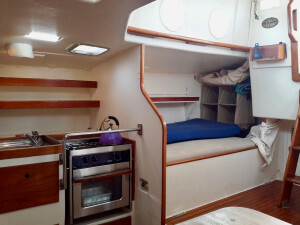 There are 3 double berths, water capacity 850 ltrs, 12v Fridge and Freezer. 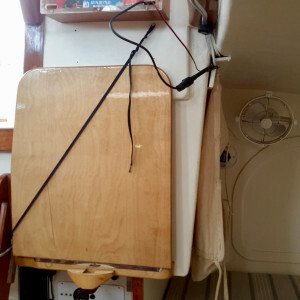 Mast/Rigging: Aluminium mast, S/S rigging and turnbuckles, fully battened mainsail new 2012, Staysail new 2012. Other: Full suspended awnings, windscoop, Hypalon inflatable dinghy with brand new motor Maxus 8hp, 3 x80 Watt solar panels, Honda 2KVA generator. The interior is simply amazing and gives a sensation of space with a mostly open layout. 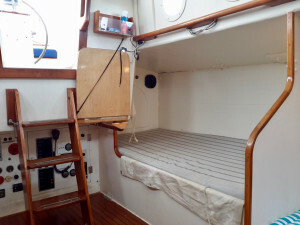 It is hard to believe that the boat is barely 43' long once on board. 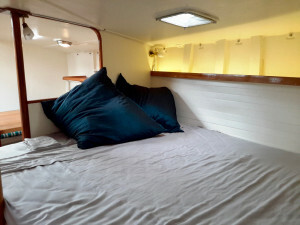 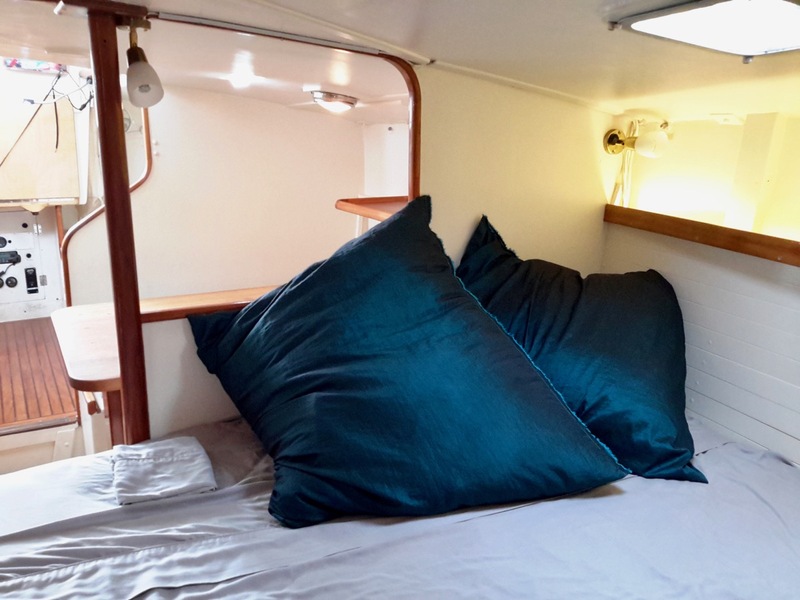 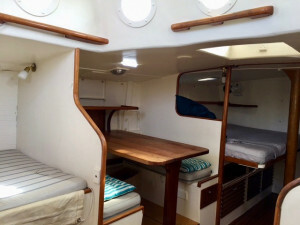 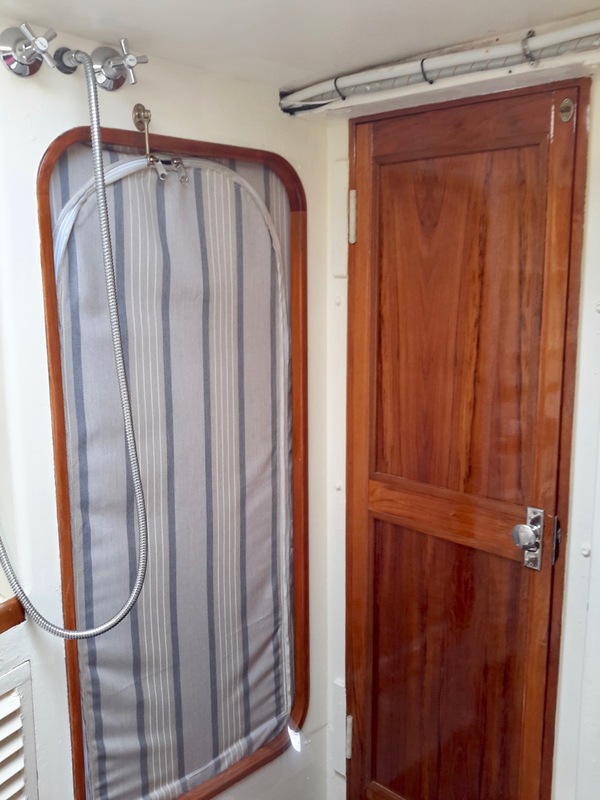 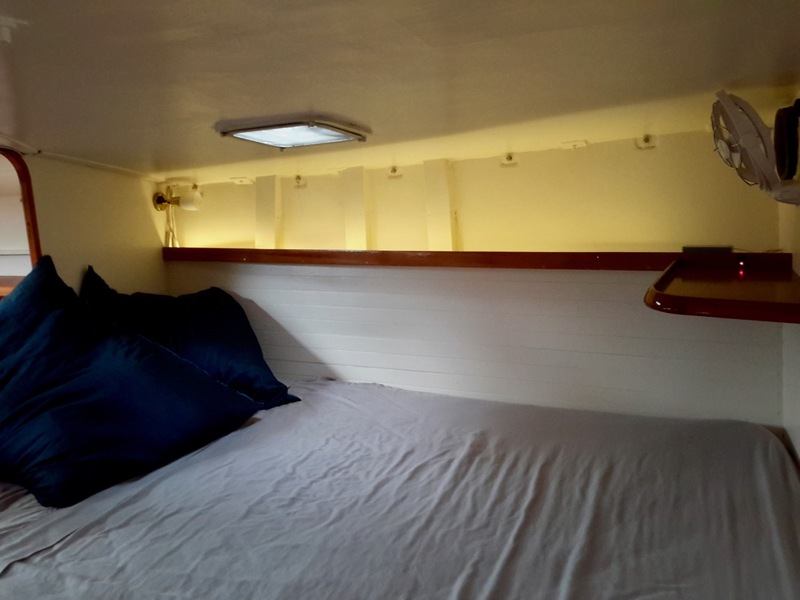 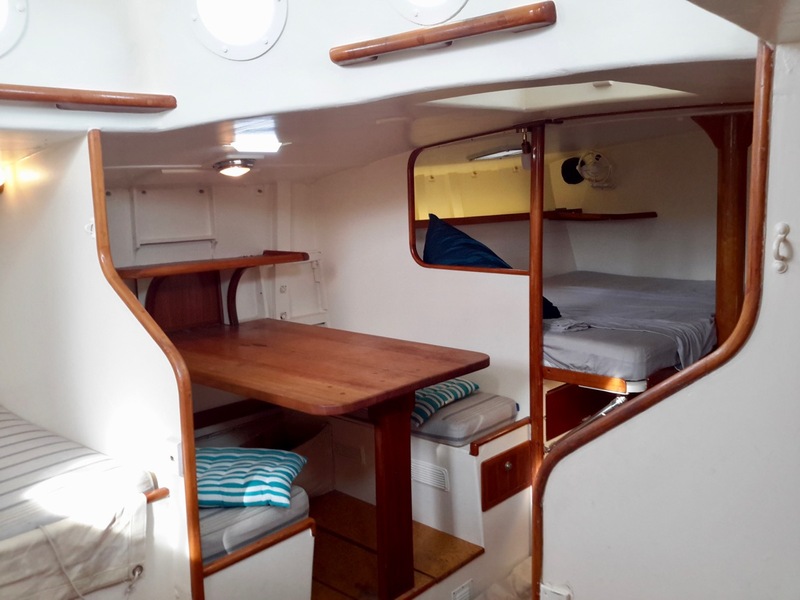 Perfect for a couple or a family, the huge master bed adjacent the very large head and shower area (truly giant for a boat this size), and there are two other double berth with lee sheets in the coach house, which are perfect as quarter berths while at sea. 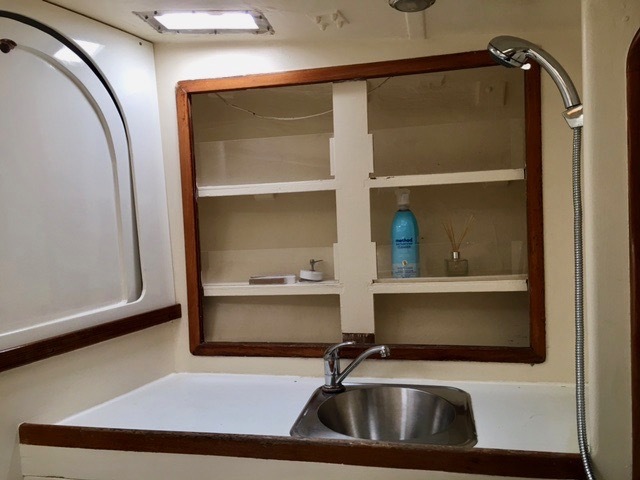 The galley is well equipped and provides very adequate food preparation area. The fridge / freezer big enough to be perfectly suited to life on board. Up above, the deck offers a vast, unencumbered space perfect for relaxing. 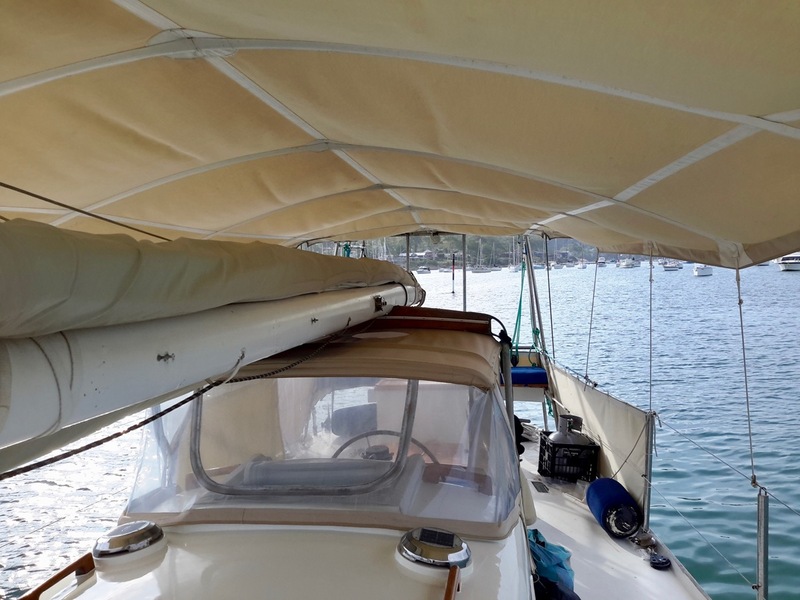 A beautifully crafted sun awning will keep out the sun and heat. 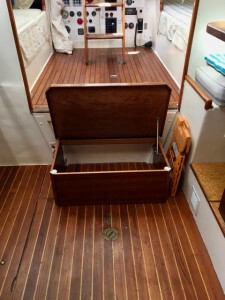 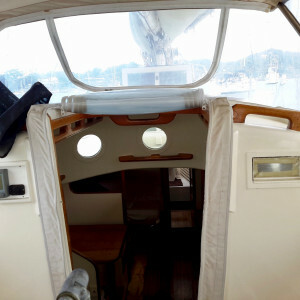 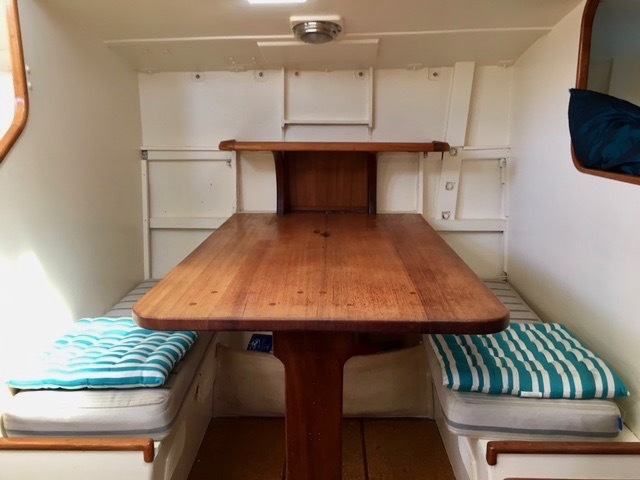 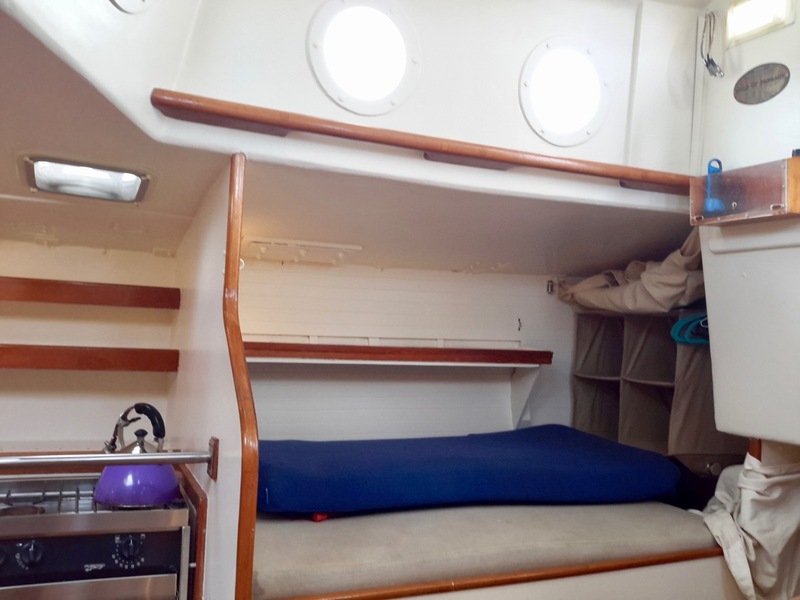 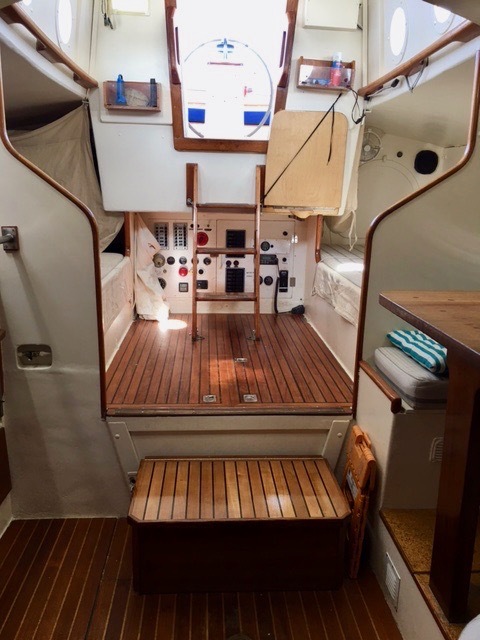 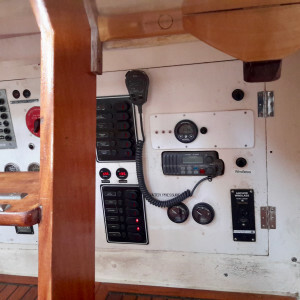 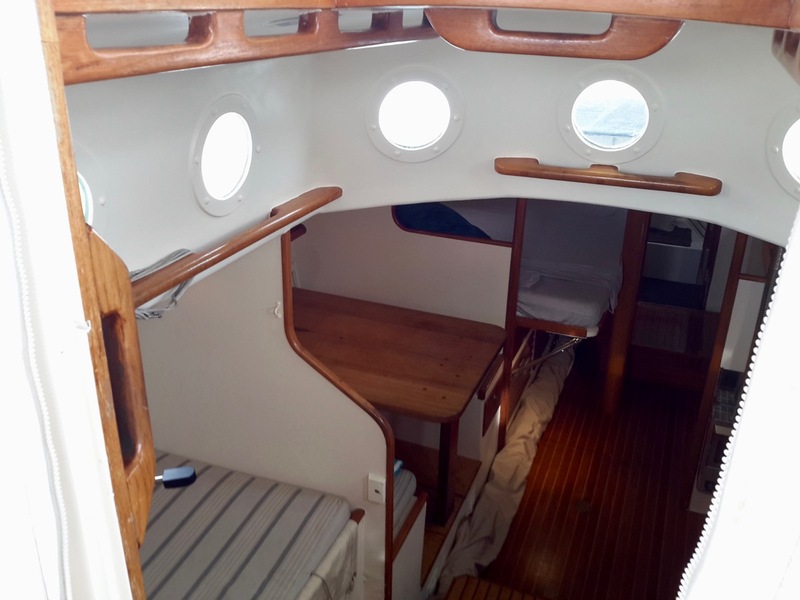 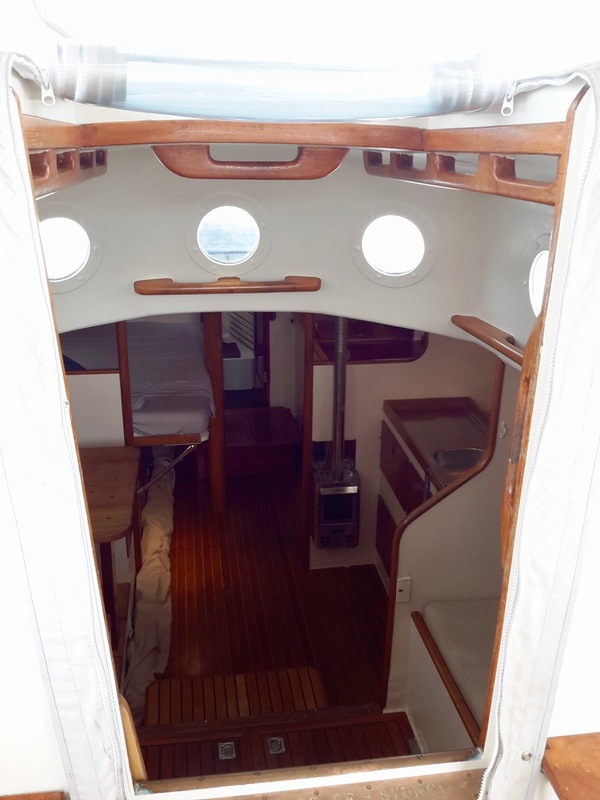 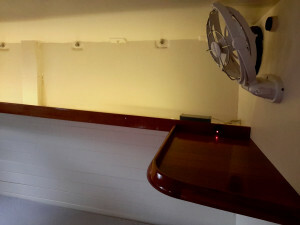 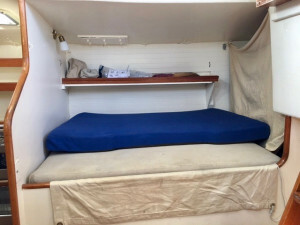 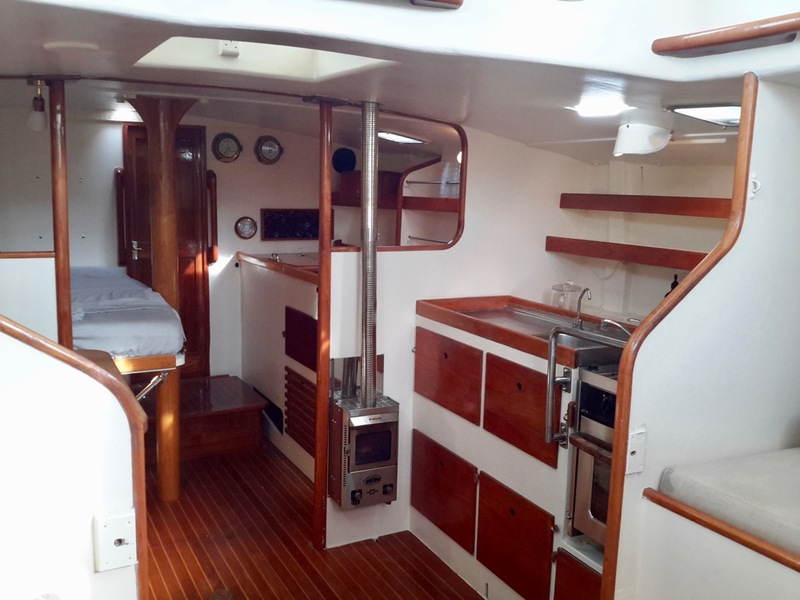 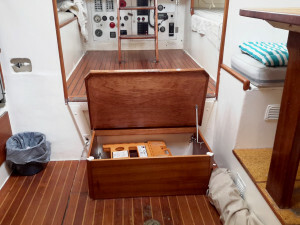 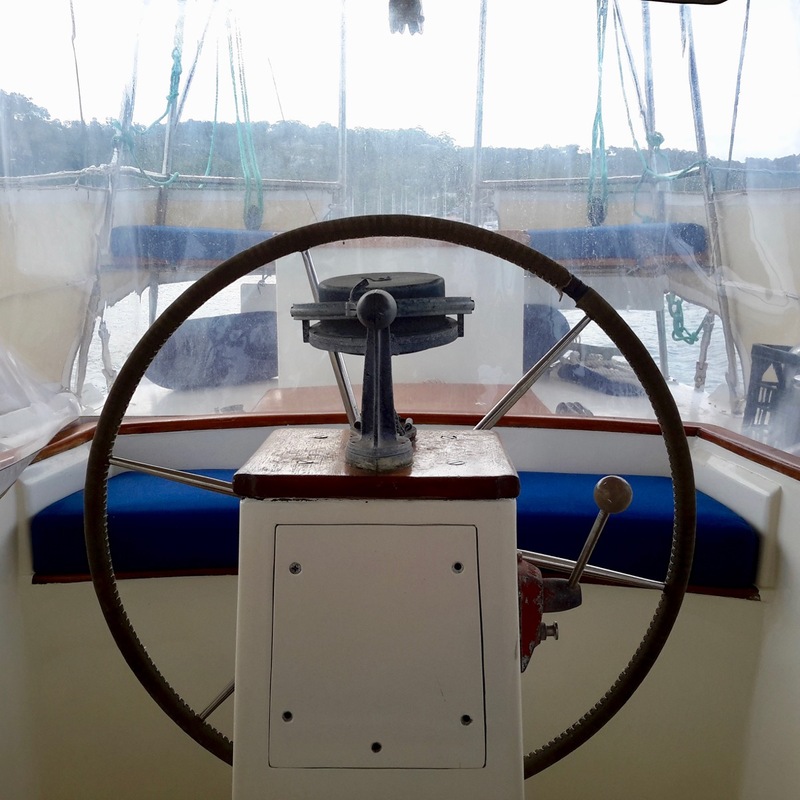 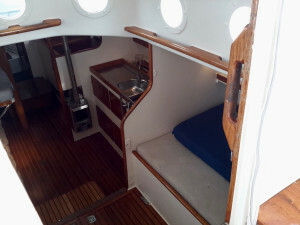 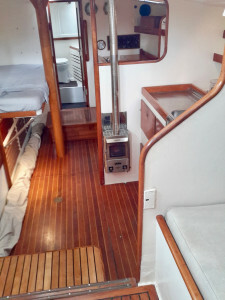 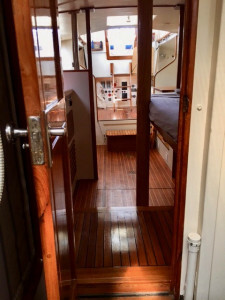 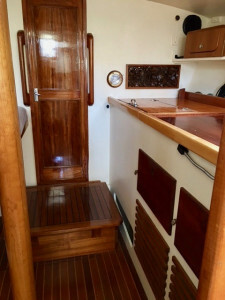 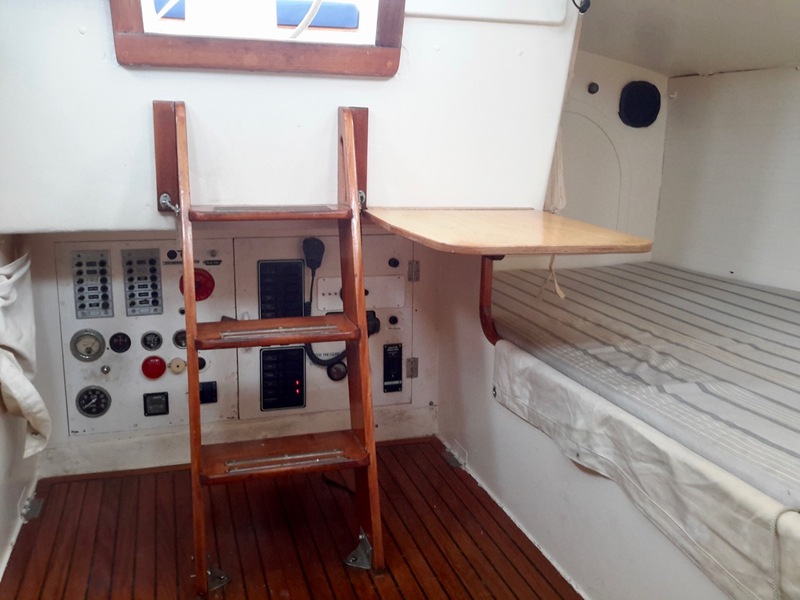 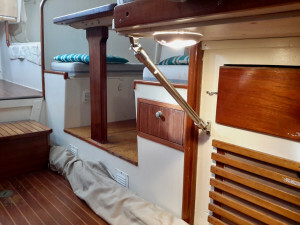 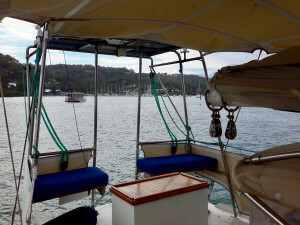 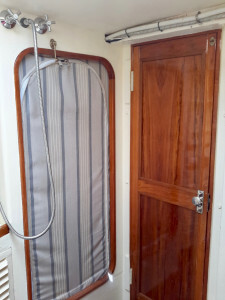 The cockpit is safe to for ocean passages when the going gets rough, and is fully protected from the cold and rain by professionally made covers. 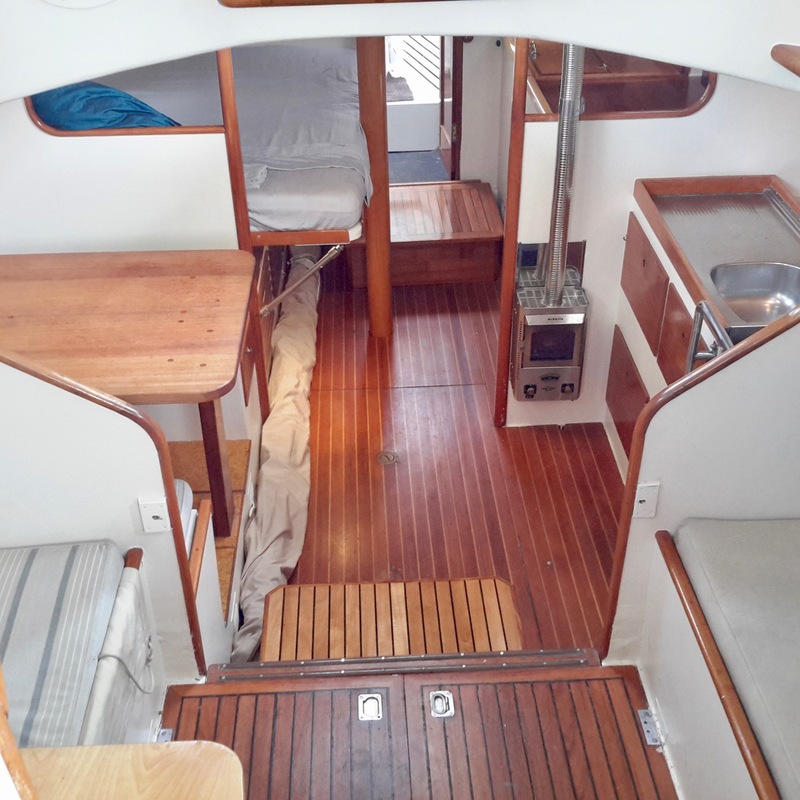 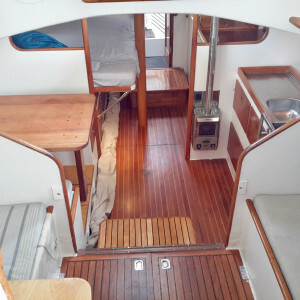 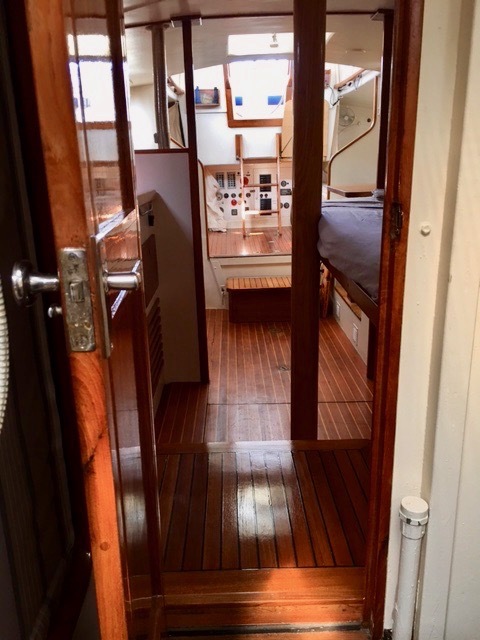 The back deck is wide and clear, and the pushpit fitted with princess seats that are just the best seat on board when cruising. 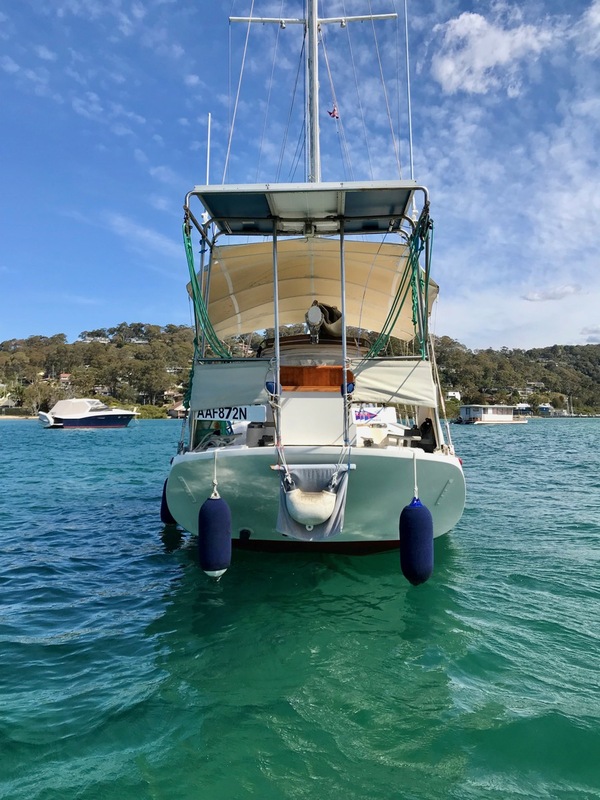 For more information about this remarkable boat please contact Anna at Nautilus Yacht Management. 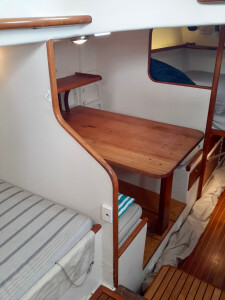 Price Base : AUD$68,000 Neg.